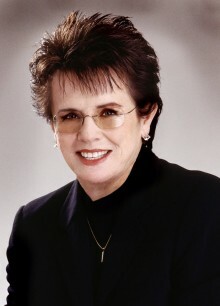 Billie Jean King is one of the most illustrious and celebrated tennis players in history. A trailblazer, she is famous the world over for spearheading the women’s movement in tennis and for her lifelong struggle for equality in women’s tennis. In 1990, Life mag­azine named her one of the “100 Most Important Americans of the 20th Century.” In 1994, she was ranked No. 5 on Sports Illustrated’s “Top 40 Athletes” list for her role in significantly altering and elevating sports over the last four decades. In 1997, she was honored at the White House with the presti­gious Flo Hyman Award, and she also won the “Player Who Makes a Differ­ence Award” from Family Circle. Billie Jean won a record 20 Wimbledon titles. She was ranked No. 1 in the world five times between 1966 and 1972, and was in the Top 10 for a total of 17 years (beginning in 1960). She has had a career of firsts. In 1968, she was the first woman of the open era to sign a pro contract. In 1971, she was the first woman athlete to win more than $100,000 in any sport. She is the only woman to ever win the U.S. Open singles titles on all four surfaces on which it has been played (grass, clay, carpet, and hard courts). She is also one of only eight women to hold a singles title in each of the Grand Slam events. In 1984, she became the first female commissioner in professional sports history (for World TeamTennis), and in 1974, she became the first woman to coach a co-ed team in professional sports (the Philadelphia Freedoms of World TeamTennis). Her many other accomplishments include winning 13 U.S. Open titles, one Australian Open title, four French Open titles, and 695 career singles victories. She was ranked in the U.S. top ten for a total of 18 years, and ranked No. 1 on the U.S. doubles list for 12 years. She currently holds the record for the most total wins in Federation Cup play, including 27 consecutive doubles matches. In 1973, she won a “Battle of the Sexes” match, defeating Bobby Riggs in a nationally televised event at Houston’s Astrodome that still holds the record for the most people (30,472) to ever attend a single tennis match. In 1979, she teamed with Martina Navratilova to win the Wimbledon doubles title, and break the record for most career wins at Wimbledon (now 20). Billie Jean was captain of the U.S. Federation Cup Team which won the title over Spain in 1996. She also coached the U.S. Federation Cup Team in 1998, and the 1996 U.S. Olympic Women’s Tennis Team. Do you want to hire Billie Jean King? Directly request a quote. In 48 hours we can send you the availability of Billie Jean King If you would like to book Billie Jean King, Entertainment Booking Agency is the right place. We will offer you the best price and contact the management or we directly contact Billie Jean King. For corporate appearances or speaking engagements you can contact our agents and the will help you true the process. Tags: hire Billie Jean King, Billie Jean King booking, book Billie Jean King, Billie Jean King appearances, find more information on booking Billie Jean King for appearances, Billie Jean King speaking engagements, Billie Jean King endorsements/spokesperson, Billie Jean King appearance fees, Billie Jean King booking agency contact info, biography of Billie Jean King, Contact an artist booking talent agent find a speakers bureau that can book Billie Jean King, speaker booking agency for Billie Jean King, Billie Jean King booking agency, Billie Jean King booking for corporate event. EBA is one of the biggest entertainment booking agencies in the World. We book hundreds of celebrities, artist, athletes and speakers in a year. Important to know is that we are not claiming to be the management of Billie Jean King. We are not the official agent for Billie Jean King. Companies from around the globe book these artists and speakers true our company be course we have one of the biggest networks and we always have direct contact with the artist or the management. We help you to find the right celebrities for your corporate of private events. Please contact one of our agents to get free advice and we will help to get the world-famous artist on your party.